CamRob planting some little container into the fridge. Paul asking Izzy to explain about the sock. The boys have woken up after a long night waiting for that all important phone call. Ned saunters into the room in his little parking person's getup wondering why he's waiting for Sindi to call - Stu should be throwing a party! Stu can't believe it, Connor's too tired to say anything and Toadie tells Ned to ease up. Ned thinks Toadie should be on his side, after all, Toadie had a bumpy ride with her too. The phone rings so Stu immediately answers it but it's Kev, so he passes it to Toad. Right on time Angie barges in; she's found the evidence of pies in the bin and she's flamin' mad. Toadie interrupts her saying dad's on the phone, handing it over. AngryAngie storms off to talk to Kev. Ned's still being evil, having another go at Stu for wanting Sindi so Stu jacks up, grabbing Ned by the scruff of the neck saying it isn't Izzy he's talking about. Luckily the boys break up the brothers before any damage can be done. Connor tells Ned to go to work, Toadie adding he should go book some old ladies. Stu thanks him for the support before Neddy finally leaves. 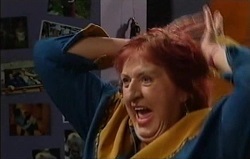 Angie rushes in all excited because big Kev's coming. Doing some hoola hooping like move. Seems to be popular these days! ANGIE: Hang onto your hats fellas, Big Kev is on the move! She runs off to doll herself up while Connor busts Angie's move, Toadie shoving him to the ground. Looks like Paul has yet again earned himself a parking infringement, Neddy's writing him another ticket. Izzy tries to run down to him in her high heels, brandish the sock and blaming him for planting it. He doesn't get it, but does admit the sock is his but he had no idea how it got in her house. Paul joins them to collect his ticket. Of course he can't believe he has one because he's parked in the driveway. Neddy points out he's park on the sidewalk by a tinsy ickle bit. Paul throws the ticket away so Neddy says he'll see him in court, and thanks Izzy for his sock. Paul says to Izzy he knew it was his. Izzy defends herself though that Ned didn't do it, wanting him to say so. Ned says that he's actually missing some boxers and if they find them under their bed, they know where to find him. Dylan's carrying the outside menu board indoors because they forgot the special. Elle and Dylan agree on chilli beans. He stops to think of when the use-by date is on them but they think it will be okay because they go off the next day. Sky arrives saying it's so weird because it's the first time she's been back since it was stolen from her granddad and Lou. Dylan doesn't agree until Sky goes to leave and admits he can't sleep at night. Sky asks for one good reason to stay so he gives her one; chilli beans for breakfast. Dylan begs her too, even kisses up her arm so she relents. When she spies Jean-Pierre come in she adds she wants it to be quick though, she doesn't want to be late. Dylan thought she hated him. When Jean-Pierre gives her the brush off Sky tells Dylan that he's trying to get a proposal for a grant, it's very stressful and that he gave some great tips on the application process. Sky's realising that there is a method to his madness, he's helping her and expanding her mind. Dylan doesn't think that means he can treat her like dirt. That the guy is a French skunk. Sky just wants her beans. When Dylan goes to get them for her Elle stops him, she doesn't want him losing it. He's the only thing keeping her sane. He says it's the worst being told that you wouldn't understand. She thinks that's fair enough, he just can't go psycho on her. She's got Paul and Izzy for that. Paul's sitting, thinkin', while Izzy's going on about if she was having an affair with that Ken doll why would she stay with him and his paranoia? She doesn't need the money because she has plenty of her own so she and Neddy could've driven off into the sunset right then. Paul realises that Ned just said it was his to put the wind up Paul so it was Cam's sock. Izzy says no he lied so that everything can be nice and sweet and boring. Ooo CamRob is listening from the stairs. Paul wonders who the hell put it there then. Izzy thinks someone planted it there so Paul suggests the sock fairy. Izzy can't believe they are fighting over a damn sock, mentioning that there is only one person that would plant it. Paul twigs she means Elle. She says if she can put pills in her food then she can do this. Izzy tells him that Elle called her a malignancy that needs to be cut out of Paul's life so she's doing everything she can to make that happen. We see CamRob smirking. Izzy wishes it wasn't true but she thinks it's clear she's trying to split them up. Paul doesn't know what to think. CamRob does though, from his face it looks like "mwahahaha!" Toadie and Stu are having breakfast when the phone rings again. Stu answers it but it's those damn telemarketers. Connor joins them complaining about Angie still being in the shower. He asks when she's going, he wants her gone. Toadie replies it will be soon enough, anyway she'll be good company when Stu and Toadie are up in Oakey. Stu says to Toad that he understands if he doesn't want to drive up there with him because Stuey won't be much company. Toadie assures him that he isn't much company anyway so he's driving him up to Oakey. Connor still upset, he wants her gone. He can't live in the house with two Rebecchis'. Toadie reminds him that he has been but Connor thinks Toadie's different. It's the phone again but Stu doesn't want to pick it up. Toadie answers, stunned, it's Sindi. He hands the phone over to Stu who is looking el' shocked. Sky and Jean-Pierre are walking in the hallway discussing paintings that they have just seen. While Jean continues his speech Sky starts feeling sick, sitting down on the floor coughing. Jean tells her to put her head down, he'll go get a doctor. She says she'll be alright. He feels her head which is burning up, asking if she's eaten something. Finally he decides to get her out of there. We see Elle answer the phone before heading over to the table where Izzy, Paul and CamRob are deciding on what to eat. CamRob suggests the beans which Izzy is up for, but Paul declines, just wanting a coffee. Now we go back to Elle who finishes up her phone call. She tells Dylan it was that Jean-Pierre guy, he said something's wrong with Sky. They shouldn't panic, she's okay now but she came down with some sort of gastro so Jean took her to the doctors. Dylan moves off to go but Elle stops him saying that she's fine plus they are busy there. Also that it could be food poisoning. Dylan says they didn't leave them out, Elle adding no one else has gotten sick so Dylan concludes it was the Uni café. Ned's wandered in so Dylan runs to meet him, asking for him to please stay outside for the sake of world peace. Ah but Neddy has yet another parking ticket for Paul for sloppy parking. Paul tells him the jokes on him because the Jag belongs to Elle plus isn't he going just a bit too far? Elle wants her dad to leave it because Neddy ain't worth it. Ned gets away with this round. Stu's in the hallway pleading to Sindi that they are both on the same page now, so they can start again. The idiots Connor and Toadie that are listening in right behind him get in the way of Stu's pacing, Stu stepping on Connor's toe. Stuey hits them both on the forehead and tells Sindi to go on, but we won't hear this conversation. Toadie and Connor go over to sit on the couch, Connor in pain. Toadie asks if it will be okay, Connor replying that it will because he doesn't think it's broken. Moron, he meant Stindi! Connor thinks they might be. Toadie hopes so, it's the only thing Stu's been living for lately. Aww! Connor wonders if she will be well enough to be discharged. Toadie thinks if anyone can help Sindi get better, it's Stu. Connor once again asks why Toadie has to go with them. He doesn't want to be stuck with Angie and her rabbit food. They are interrupted by a huge truck, luckily without it's load, arriving in the street. Angie with the biggest yellow flower I have ever seen in her hair acting like a teen going on her first date. We cut to the boys opening the door to a sweaty, singlet, stinky looking Kev saying he's stuffed. Angie isn't too impressed with what he's wearing, he looks like a wet ferret. Ferrets are beautiful creatures. Following him to the lounge she continues to complain, she hoped he would at least put on some decent clothing for her. He reminds her he's driven all night to get there, saying she looks like she's been to a blue light disco. Angie stops her whinging, asking him to say he's sorry. But he won't because she started it. She doesn't think so because he called her a flamin' bludger. He says she is, they're too young to retire. Angie's about ready to send him back to Colac but he ain't budging. Good thing because Toadie drags Connor into the hallway with a plan to get them back together. They're going to take a parent each and establish grievances so they can get a truce. In the lounge room Toadie asks Angie for details on what he does wrong. She replies that he spends too much time on his rig than with her. In the hallway Connor relays that to Kev but he doesn't understand. He tries to explain but Kev does get his Scottish ringo. Err wha? Now Toadie tells Angie the only reason Kev spends so much time on his rig is so he can afford to buy her clothes and plasma TVs. She says that he doesn't have to leave her at the roadhouse run off her feet like a dog. Connor and Toadie meet in the middle with their information. Toadie says he's taking her for granted. Connor tells him she isn't running the roadhouse anymore, Stonie is. And he's glad she left so he can get some work done and not have to put up with her bossing him around. Toadie wants him to chill, he's just a delegate. They go back to their questioning… Angie explains that she's sick of being bossed around and see the road like he does. Toadie suggests she get her heavy licence and get on the road with him. She doesn't seem to mind that… Kev says to Connor that he's been telling her that for three years. Connor replies that Angie just wants a holiday. He agrees so they can stop the blueing. 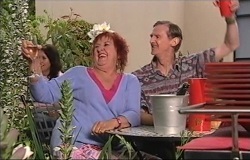 Now we cut to Kev and Angie agreeing to a holiday to Kakadu and she can drive some of the way if she gets her heavy licence. Kev adds that there will be no three star hotels either, they will be ruffing it. Angie wants a new tent which Kev agrees to. The Rebecchis' are back together! Toadie and Connor run over to Stu asking how it went. STU: Well it looks like we're both going to have to start talking a bit slower ay? The Parkers are back together! Off-screen Stindi reunion! Oh happy days! Jean-Pierre is setting up art related things up on the dining room table when Sky walks out, apologising for his car. Oo I think she might've messed it up if you know what I mean. He says it's alright about the car, asking if she's alright. She isn't as bad as before so Jean-Pierre wants her to draw. She feels shocking but Jean-Pierre wants her to draw a shocking drawing. And if he's being cruel, use it. She agrees on one condition, “I'll show you mine if you show me yours”. Jean-Pierre thinks she can vomit on someone's car then order them around. She tells him that if he finds that annoying, use it. He realises he walked right into that one, sitting down across from her. They exchange ickle smilies. Totally ignoring Neddy walking in behind them, oh and Kev and Angie talking at the table nearby, Toadie tells Connor if he wasn't so underqualified he'd ask him to put Tim on as partner. Connor shoves him in the shoulder for it. I think they're drunk. Neddy's over with Stu at the bar asking if he needs a hand to take over the four beers Stu ordered. Nope! 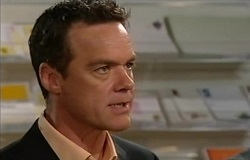 Ned asks if Stu's heard from Sindi. Stu's so happy, he doesn't have to pull the ring off after all. Ned's sorry about before but he didn't want to see Stu hurt again. Aww brothery love. There's more of it when they get to Toadie and Connor's table because Connor's gone all soppy. He loves Ned and Stu like brothers, give them both a big hug. I think he's drunk. Angie, looking over at the boys, ask if ‘he' will go for it. Kev says he won't give him any bloody choice. They toast to their conspiracy. Sky and Jean-Pierre are drawing away, Sky stops, showing him the abstract drawing she's done. Jean says it's good, it reminds him of the things he used to draw. She wants to see his but he hides it, saying there's nothing to see. Sky doesn't believe that because she's seen his paintings in books at the library and it's amazing. He says that it was ten years ago, in the past five years he hasn't done anything worth looking at. He's a has-been. Sky doesn't think so, asking to look at the picture. He hands it over… she thinks it's good, it shows his discomfort. He wants go because he doesn't want to squash her talent any further. She thinks he knows a million more things about art than she ever will. Pausing, she says that she preferred him when he was scary. Ah he remembers, the old angry art teacher routine to cover up the truth - he's a fake. He reveals that even his name is fake. It's John Peter Valasco. Sky tells him if he ever goes for the fake name again to not go for some so cliché. She's going to call him JP from now on. He likes it. The boys have gotten more beers over at their table of brothery love. Connor: Stu I don't know what I'm going to do without you. STU: Well I do. You're going to drink more beer and eat more pizza. Connor: You know me too well. Toadie takes some beers over to his parents but Kev doesn't want any because he's going to drive. Toadie's overjoyed even if he doesn't show it. Angie starts with the “Your our pride and joy” line, Kev adding that they never get to spend much time with him. So he's coming with them. Toadie thinks they're nuts. 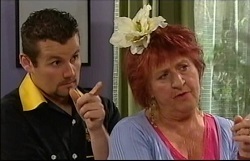 Angie shouts over to Stu that there is a change of plans; they're taking him up to Oakey. Toadie protests about not having their bags packed but Stu says his are. Toadie tries to talk Stu out of it but Stu wants a ride on the big rig. Ned can't blame him. John Peter is busily drawing away when Sky sneaks up behind him. He spins around, hiding the picture from her. He doesn't want to show her because it might disappoint her. Joh decides to finally go, asking how she's feeling. She's feeling better. As he opens the door, Dylan's standing there. JOHN: Oh hello. She's right here I was just going. Well duh. Sky calls out goodbye to JP to Dylan's disgust at the new nickname. She drags him to the kitchen bench telling him not to worry about the food poisoning just to tell him what he thinks about the picture. He thinks it's kind of like a nightmare. Sky agrees saying that she doesn't know how but John draws it out of her somehow and the weird thing is she did it to him too. Dylan is thrilled. Kev and Angie are happy talking away while the boys are in their yellow sheet trying to get the confidence to do what they are about to do. Which is Stu passing on a House Of Trouser tradition. They move out and take the sheet away revealing House of Trouser nakedness. Girls, just concentrate on Stu and Neddy (if you're into him). The boys are having a great time but leave Stu behind when he shouts out “Freedom!” LOL. Everyones shocked but Kev and Angie think it's hilarious, cheering them on. It's that moment we've been dreading. Kev and Angie start with putting stuff into the rig while Connor clings to Stu for dear life. They can't believe it's really happening. Stu tells Connor when he has cold pizza a beer or finds moldy jocks under his bed he'll think of them. Toadie doesn't think Sindi will be letting him do that. Stu wants to go around the street and say goodbye but Kev won't let him. He has no idea how he's made the Stusan and Stuph fans very upset with that line Toadie helps hoist Angie up into the rig while Stu talks to Ned. Ned wishes him luck, Stu telling him to follow his dreams and not let his new job turn him into a jerk. Toadie asks Stu to go so Connor has one last hug with Stu, telling him to send an email once a week with pictures. Ah he gets another StuHug™. They finally go into the rig, Stu and Toadie sticking their heads out the window chanting the HoT chant. The truck head off down the street, the boys waving. Connor gives Ned a hug. What is it with that guy in this episode? Bye bye Stuey I am going to miss your cuteness and shirtlessness At least it wasn't a yellow taxi this time… but what about his car? Paul's going off his top at Elle and Dylan while Izzy and CamRob watch on. Paul tells them if Health and Safety pass both the café and the GS then they might have a second chance. PAUL: But I tell you what if this ends in disaster, that's it. You can both kiss your jobs goodbye for good. Jip! He stops them from talking. Everybody exchanges looks.